Just as it once helped Marlboro cigarettes push into Asia at the end of the last millennium, public relations giant Burson-Marsteller is helping Peabody Energy, the world’s largest private coal company, become the dominant supplier to the world’s most ravenous coal market, a role worth billions to Big Coal that could lock in decades of dangerously high carbon emissions. The move into Asia is synchronized with a Burson-Peabody worldwide PR campaign and messaging blitz called “Advanced Energy for Life” (AEfL) that is designed to shift the focus from coal’s leading role in pumping carbon dioxide into the atmosphere to what AEfL calls “energy poverty” — the alleged cure for which is cheap coal-generated electricity for the substantial areas of the developing world, and especially China, with little or no access to power. Burson-Marsteller, which has a long history of creating front groups to rehabilitate the images of corporate wrongdoers, helped Philip Morris, maker of Marlboro, tackle the Asian market, where Burson fought anti-smoking regulations and developed crisis drills for Philip Morris personnel in Hong Kong on how to handle adverse scientific reports. Environmentalists accuse Advanced Energy for Life of posing as a sort of anti-poverty NGO while actually being a a disinformation and political pressure campaign designed to cripple measures slowing the growth of greenhouse gases. By stalling carbon limits, say critics, Peabody, an American company, hopes to buy itself time to shift from selling domestic coal here in the U.S. to exporting American coal to Asia or mining Asian and Australian coal and selling it abroad. Another important part of the AEfL campaign is its claim that “clean coal technology” can transform the single biggest contributor to global warming into a green energy source despite the failure to date of efforts by Peabody and others to make such technology a practical reality. Burson declined comment for this article, referring all questions about Advanced Energy for Life to Peabody. In a written response, Chris Curran, Peabody’s vice president for corporate communications, insisted that in fact the company “launched the Advanced Energy For Life campaign to engage in a global dialogue around how to combat global energy poverty, increase access to low-cost electricity and improve emissions using today’s advanced clean coal technologies” — a term he said is “widely accepted.” Coal “is essential to providing electricity at a low-cost and large scale way to help billions of people around the world that desperately need more energy. Energy is clearly linked to better education, health, longevity and quality of life,” Curran wrote. With Wall Street predicting an economic and political bounce for Big Coal following the takeover of the Senate by a GOP that hates carbon limits, Peabody’s sights are set on influencing the climate agenda at the G-20 economic summit in mid-November. All of which, climate activists say, makes the AEfL campaign a propaganda gun pointed directly at the decision-making machinery that will influence how the world deals with the No. 1 threat to its existence. If anybody can help Peabody throw sand into the gears of decarbonization, it’s Burson-Marsteller, one of the world’s largest PR companies and one with unmatched access to government and business leaders all over the world. One quick example. According to previously confidential State Department documents released through WikiLeaks, Burson-Marsteller representatives were included in a series of high-level meetings in European capitals in November 1975 where U.S. Senate staffers probed allegations of bribery against aircraft manufacturer Lockheed in trying to sell its L-1011 jumbo jet, as well as fighter and transport planes. Lockheed was a Burson client, and B-M were granted the same access to Senate staff as high-level European defense, military and aviation industry officials in Paris and Brussels. That was almost 40 years ago. Since then, Burson’s influence has only grown, especially after it was swallowed up by WPP, a worldwide communications goliath that owns Hill-Knowlton Strategies and 56 other PR firms, not to mention 100 advertising agencies. B-M itself has 2,300 employees in 110 countries. Among Burson-Marsteller’s most notable previous clients was Big Tobacco, for whom it did a lot of work, important work that helped the industry survive into the 21st century while making record profits. Sixteen of the country’s top 25 PR firms represented the cigarette makers at one time or another, but Burson was especially important because it helped Philip Morris launch a worldwide campaign denying that secondhand smoke — also called environmental tobacco smoke (ETS) – caused cancer, despite solid scientific evidence that it did. That effort involved monitoring anti-smoking activists, setting up front groups, and getting press coverage for allegedly independent scientists who were secretly funded by tobacco to do studies casting doubt on the dangers of ETS. The program was to include staging elaborate damage control drills for Philip Morris employees in Hong Kong in anticipation of the release of a finding by the International Agency for Research on Cancer (IARC) that ETS was carcinogenic. These efforts were part of a broader plan in which B-M helped Philip Morris, whose American and European operations were increasingly hamstrung by anti-tobacco regulations, increase its market share in Asia and in particular crack the Chinese cigarette market, the largest in the world. It is a strategy that seems largely to have succeeded. Of course, Burson-Marsteller has also flacked for numberless corporations experiencing more or less short-term crises — for instance, for Union Carbide following the methylisocyanate gas leak from its pesticide plant that killed some 5,200 people in Bhopal, India, in 1984 and for nuclear reactor designer Babcock & Wilcox after the near-meltdown at Three Mile Island. What it has undertaken with Peabody Energy, however, is at least as ambitious as what it did for Big Tobacco: a worldwide campaign designed to keep the world burning coal for as long as possible that began in January 2014 with the launch of an Advanced Energy for Life website followed by a Twitter site a month later. Also in February, AEfL ran a full-page ad in the European edition of the Financial Times featuring, among other things, a photograph of Asian children huddling together as they tried to read a book by lantern light. Peabody and Burson didn’t quite get away with that one. After a challenge by the World Wildlife Fund, the United Kingdom’s Advertising Standards Authority ruled the ad’s reference to “clean coal” was misleading since current technology “was not able to prevent CO2 from being emitted …” But the ASA didn’t agree with WWF that Peabody should stop claiming it was fighting energy poverty because it really just wants to sell more coal. So AEfL has continued its propaganda blitz in print, via YouTube and through informational workshops preparatory to the G-20 economic summit, which is to be held in Brisbane, Australia, beginning Nov. 15. (One new wrinkle in the message: At a conference last month in Copenhagen, Peabody chief executive officer Gregory H. Boyce claimed a lack of electricity in Africa is impairing the fight against Ebola.) The G-20 itself will be a warmup for what are expected to be similar lobbying efforts at upcoming global warming conferences leading up to United Nations Climate Change Conference in Paris in late 2015. Burson-Marsteller already has significant experience in this area. Prior to the 1992 Earth Summit in Brazil, Burson was hired by the Business Council for Sustainable Development, a group of 50 multinational corporations opposed to greenhouse gas regulations. Somehow, Stephan Schmidheiny, the head of the Council, was then appointed principal adviser for business and industry to Maurice Strong, organizer of the summit — making Schmidheiny Strong’s one and only principal adviser. “With the able assistance of public relations giant Burson-Marsteller, a very elite group of business people (including B-M itself) was seemingly able to plan the agenda for the Earth Summit with little interference from NGOs or government leaders,” wrote Joyce Nelson, a journalist specializing in the PR industry. Peabody and Burson’s ambitions in Asia may be especially fateful for the future of global warming. World energy demand is expected to double by 2050, with coal the fastest-growing major fuel, one that is expected to account for 40 percent of global power generation by 2035, surpassing oil. Peabody predicts that more than 80 percent of the growth in global demand for coal will come from China and India. China, which already emits almost 30 percent of the world’s greenhouse gases, is expected to double its CO2 output over the next 25 years. Should the status quo in Asian emissions continue — in fact, unless those emissions are cut drastically — scientists say irreversible damage will be done to the earth’s atmosphere, locking in catastrophic changes in sea level and weather. Such an Asian carbon bubble would nullify even the most radical climate mitigation efforts in the rest of the world, scientists predict. And those in the poorest countries of the developing world would be victimized first and most severely by the effects of global warming. One sign of how Peabody and Burson are scaling up their Advanced Energy for Life campaign and preparing to muscle into Asia came earlier this year when Peabody’s Australian subsidiary, Peabody Energy Australia, dropped two Aussie public relations firms that had lobbied on its behalf for years in favor of B-M. The firms Peabody dumped, CMAX and Kreab Gavin Anderson, are Australian PR companies that represent many of the country’s mining and coal interests, while B-M’s only lobbying clients in-country are three telecommunications or computer firms. 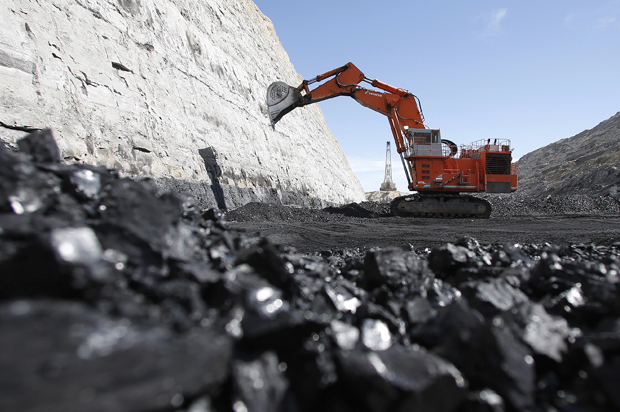 The Asian connection makes sense for Peabody because it is the only American coal company with assets in Asia and the Pacific Rim, including 10 mines in Australia and the facilities to ship coal to Asian markets. Peabody is already China’s priority coal importer, thanks to a partnership with the country’s largest state coal company, the biggest in the world. In April, Peabody signed an agreement with the Chinese to develop an enormous coal mine in the Zhundong region of Xinjiang, China. The ongoing transformation of an Appalachian-based coal supplier for American utilities and steel mills to a truly international player is an effort to escape increasingly stringent carbon regulations and a declining market for coal here. This reinvention didn’t happen overnight. In 2003, the company’s international operations generated only 2 percent of its earnings. Now they account for over 40 percent. But the significance of Peabody’s pivot to the East isn’t only an increase in Peabody’s stature as a global producer. There are bigger coalers, like the Chinese state-owned enterprise, but they’re not running massive PR campaigns. It’s Peabody’s zealotry in blocking efforts to retard global warming that concerns observers. In hiring Burson, Peabody demonstrated a determination to prevail that seems born of desperation. It has good reasons to be desperate. As of Sept. 19, Peabody’s market capitalization had fallen to $3.7 billion, down from a high of some $20 billion three years earlier — a drop so steep, its stock was removed from the Standard & Poor’s 500 Index. A company that had been one of the biggest in the country no longer was, joining a lesser group of corporations called the Standard & Poor 400 Midcap. Despite that, Peabody remains the richest and biggest American coal company. Yet Peabody has officially fallen into capitalism’s second tier. By corporate standards, it is collapsing. The alliance of Big PR and Big Tobacco bought the cigarette companies several extra decades in which to reinvent themselves and adapt to new conditions. During that time, countless millions became addicted to nicotine and many died of smoking-related illness. Big Coal’s prognosis may be worse than that of the cigarette companies, but in the meantime the impact of campaigns like Advanced Energy for Life could rival or even surpass Big Tobacco’s PR efforts for its effect on human welfare. The question is, how much can Peabody damage the planet on the way down?